I have included different clinical cases about, Veneers, Onlays and Crowns, complete dentures, overdenture, full mouth rehabilitation or reconstruction, Prosthodontic treatment for patients after oral cancer treatment, etc. There are so many little things that are involved in treating a patient that I merely cannot put all of them on the web, but I hope you learn from the cases on this site. 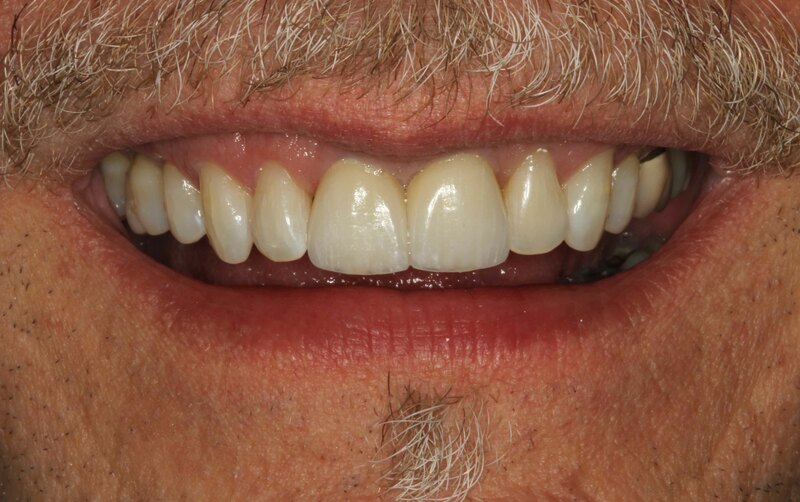 If you see a “before” smile that resembles yours, please know that we can make your “after” smile beautiful, the same as each patient on this site had their smile, and life, completely and positively changed. If you face a similar problem, do not hesitate to contact us to set up a consultation. My goal is to provide you a range of reasonable treatment options. It is up to you which one to choose. We provide the best quality of care and use only the best dental products and technology available. In addition, we take the time to provide a complete and permanent solution for your oral health needs. We will never compromise your health or the aesthetics of your smile in the interest of a cheaper solution. This patient presented to me to complain that she did not like the look of her veneers and one of the lower veneers had moved out of its place. 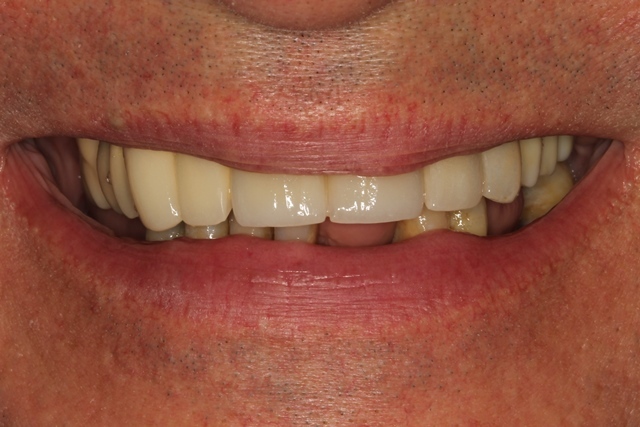 After a thorough clinical exam, I realized that the patient didn’t have four veneers on the upper arch but two porcelain veneers and two crowns. I explained to her the difference in materials used to fabricate the crowns and veneers is the reason they don’t look the same. Optical properties of different porcelain are vastly different and mix and matching them is not a good idea. She asked me to do whatever was necessary to match the shape and shade of her veneers to idealize her aesthetics. 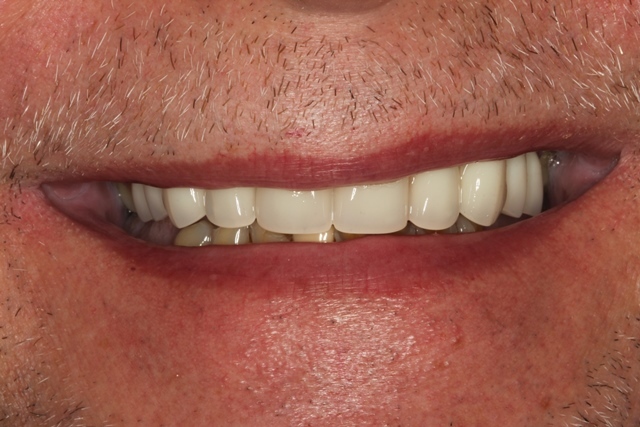 I replaced the Old Mismatched Crowns and Veneers with a new set of four all ceramic crowns in the upper jaw and a set of three veneers & a single crown on the lower jaw to idealize the shade, shape and arrangement of the teeth. All the restorations were similar except the one crown on the implant in the lower arch, but it was characterized with various modifiers to match the shade of adjacent veneers. 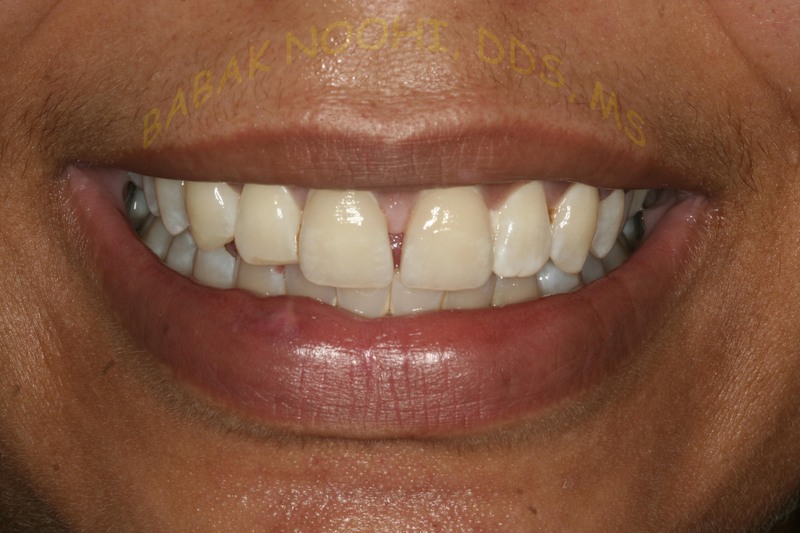 Initial presentation and Unhappy with the look of her Crowns and Veneers. 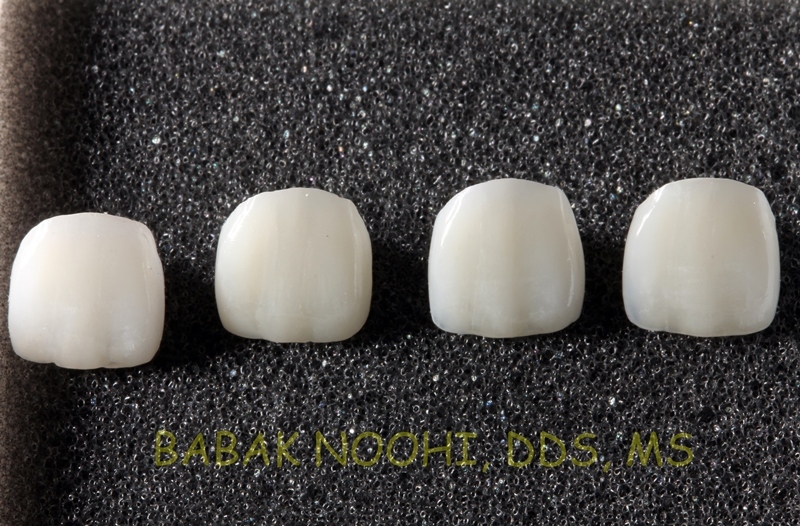 New Ultra Thin and highly customized Veneers by a Master Ceramist. Treating dentists is not an easy task. 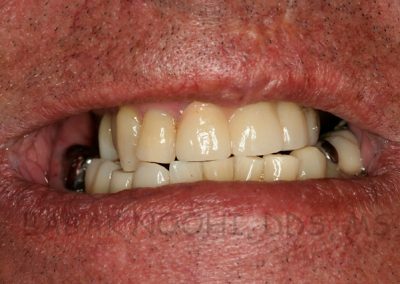 As a prosthodontist I was up to the challenge and felt privileged to be asked by my colleague to address his cosmetic concerns. 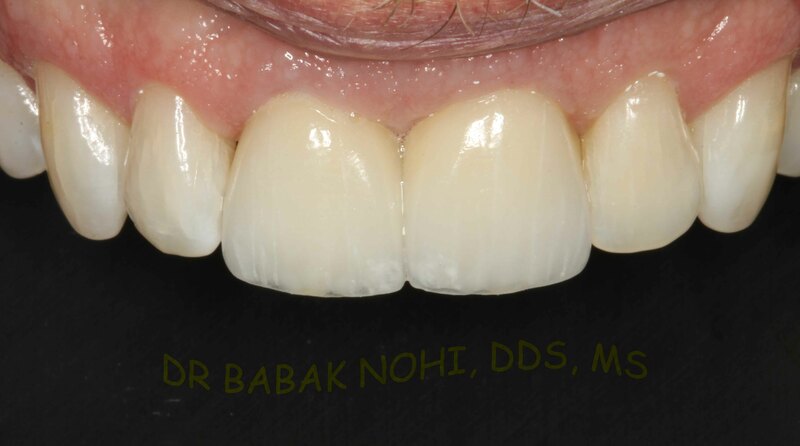 Guiding the master ceramist to characterize the shade, shape and internal characteristics is something a prosthodontist can achieve for you to idealize your smile and bring back the lost confidence to smile. 03 New Highly Customized natural looking. It is almost impossible to tell these crowns are fake by untrained eyes. 04 New Highly Customized natural looking. PFM crown #30. 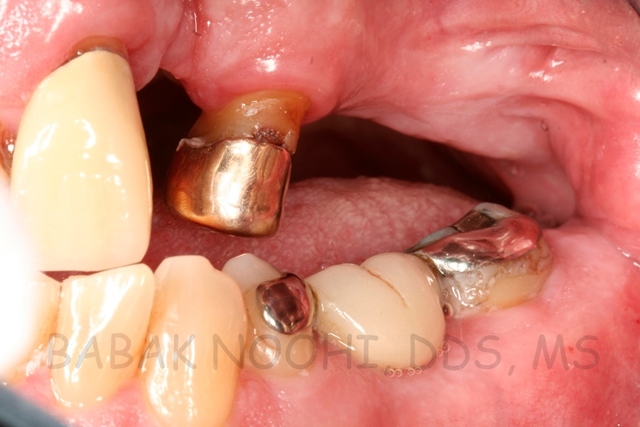 A Metal Island on top of the crown indicates inadequate tooth preparation & poor design (left photo). The crown was replaced with an all ceramic crown due to an open margin and tooth sensitivity that did not go away for several months. 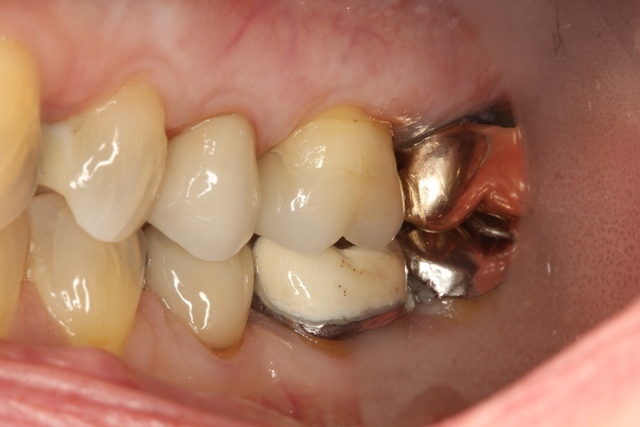 Metal showing under the porcelain is usually a poor sign and shows a crown done improperly. This is a one year old crown. 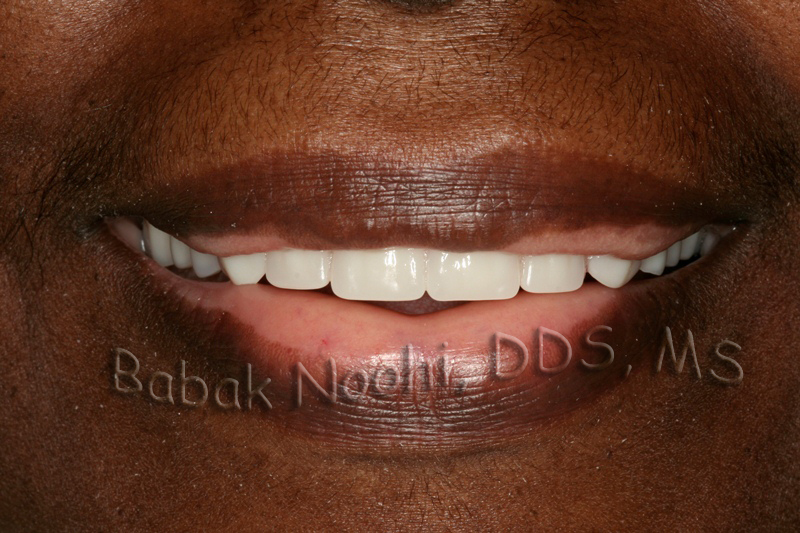 Black line at the margin , silver color on the top and the shade does not match the adjacent teeth and all together making it look like a fake tooth. Excellent shade, and careful Crown fabrication has made it blend well with the adjacent teeth, looking impossible to to identify of a fake crown. 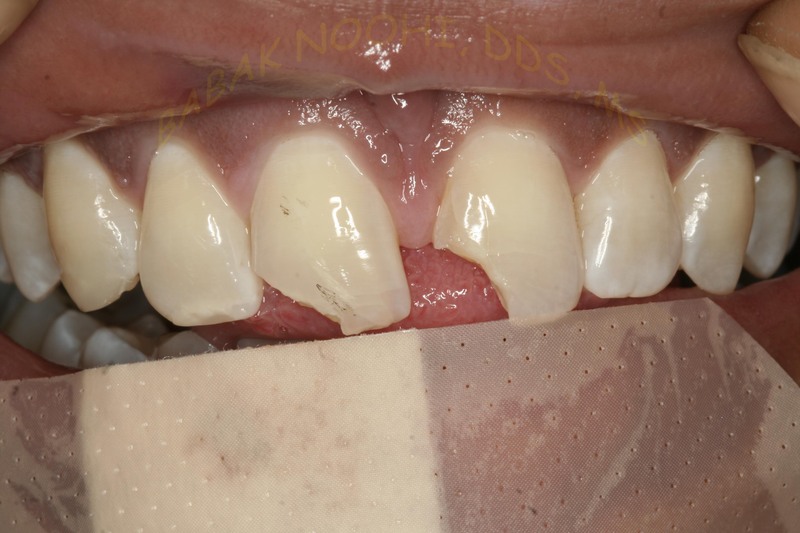 Replacing a discolored bonding with a Porcelain Veneer. My patient was getting married and she wanted to smile with confidence for her wedding pictures. 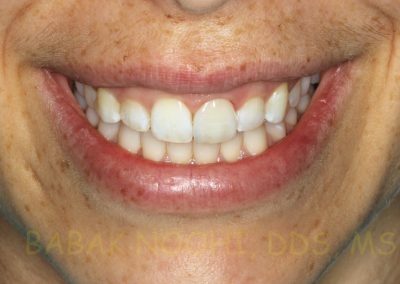 A few dentists had offered her to do at least two veneers so they can match the incisors and get an ideal outcome, but she did not want to have two veneers. 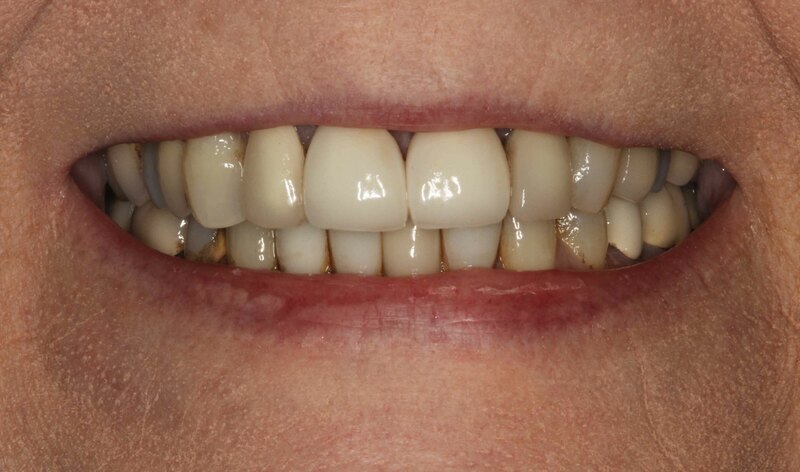 When she came to see me for a consult, I offered her to do a single veneer for an additional fee but I promised her I will make sure she is absolutely happy with the outcome and I promised the single veneer will match the adjacent real tooth. This is not an easy task and I was up for the challenge. 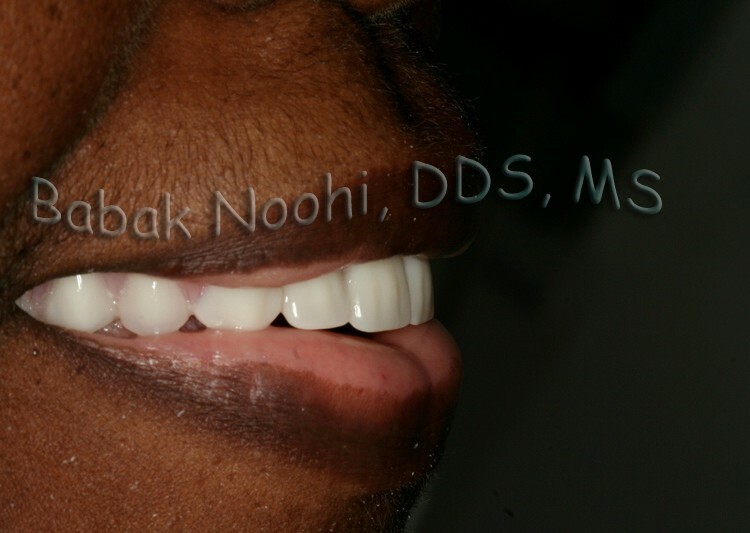 I had four different veneers made to and I chose the one that matched the best. The differences were rather subtle but I want to and excellent result and not a good one. She was extremely happy with the outcome. Initial Exam, #9 discolored Bonding. 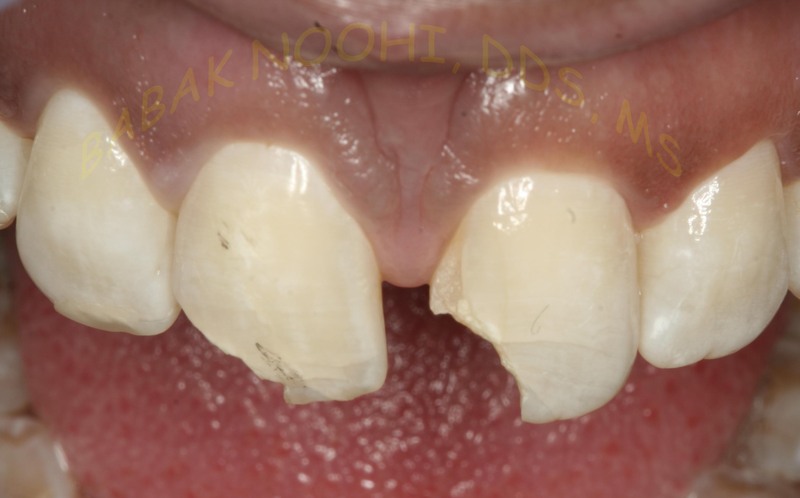 Patient had fractured her front tooth and it was restored with Bondings twice. But never looked good. Minor Changes, mainly in characterization and surface texture, to choose from for the ideal match. Final Delivery of Porcelain Veneer #9. 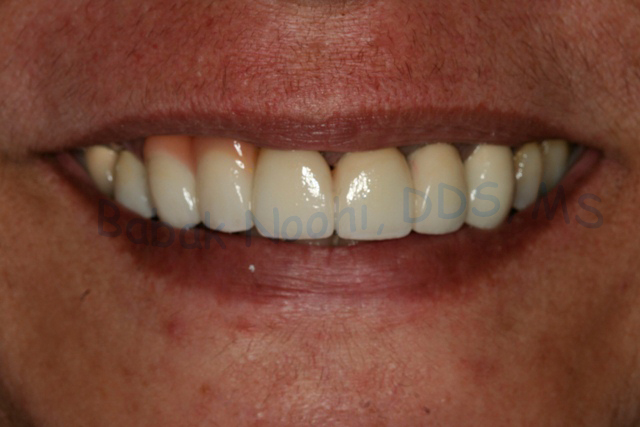 Patient could not be happier and was exteremly happy with the outcome. It looks as natural as her own tooth. 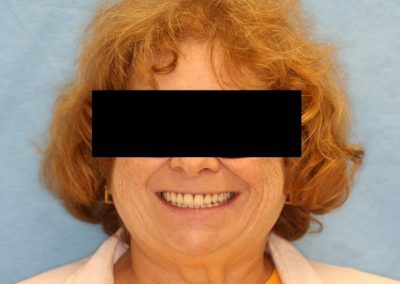 This middle aged female was frustrated with her front teeth and the way she had to cover her lips before smiling. 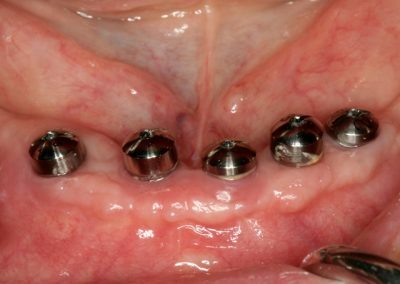 A long term ailing dental implant, which was left unattended, had caused significant bone loss and a large defect after it was removed. The bony defect could not be rebuilt after two regenerative surgeries (at another dental office). 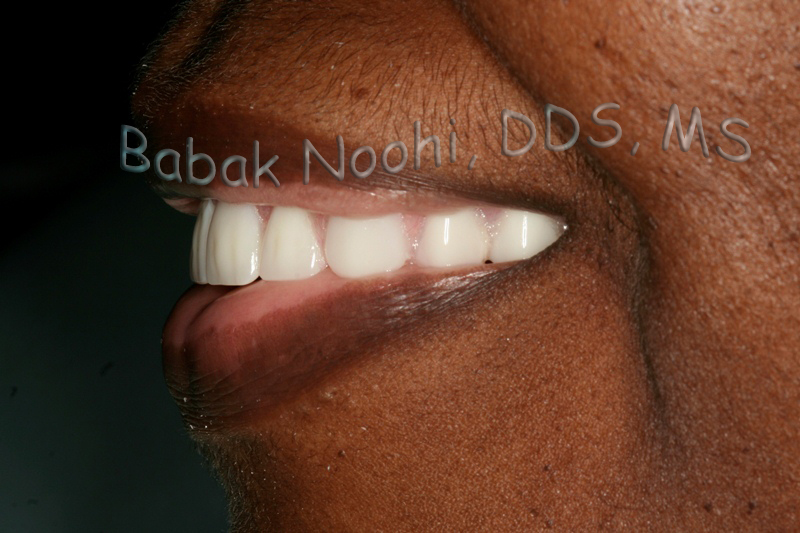 Finally she was referred to me for a none surgical prosthetic solution to replace her missing teeth. A well desinged long span bridge with Porcelain margins ( to eliminate the black line at the margin) was fabricated and delivered after three visits. I never forget how she hugged me in tears for several minutes when her case was completed. She is still doing fine without any complications after nearly 10 years. 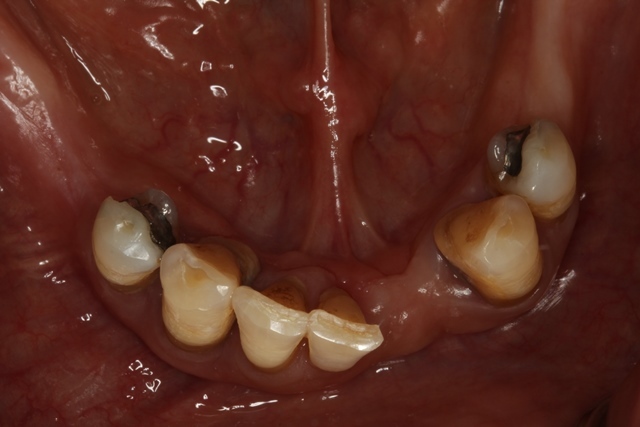 Large jaw defect after tooth loss due to periodontal disease. 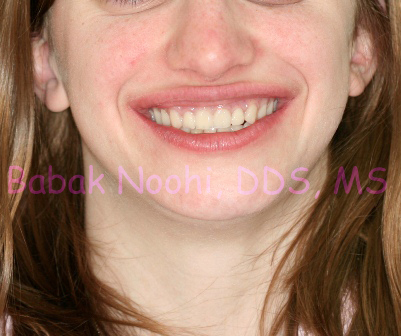 Patient not happy with her smile, she asked me to do my best to improve it, while replacing the missing tooth, #10. 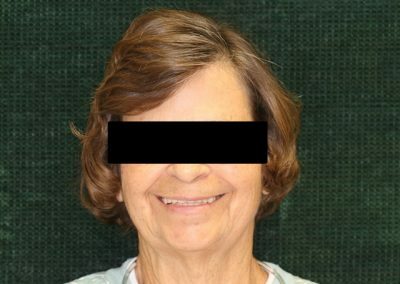 Surgical reconstruction of the lost jaw was not successful and patient was refered by her periodontist to have the defect replaced with prosthetics. Fabrication of a Bridge with Pink Porcelain to mask the defect. 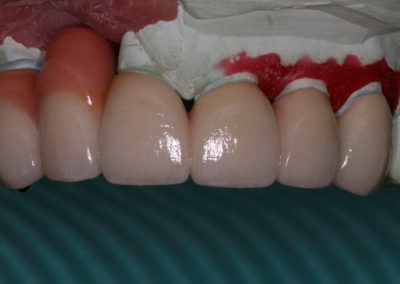 Even though the porcelain looks good and I knwo the ceramist did her best, but the quality of the work is not excellent with compared to the bridge case below. skills matter. Final Delievery of the bridge. Prosthodontic reconstruction of a large Defect using Pink Porcelain. This Bridge has been successfully in function for 12 years. 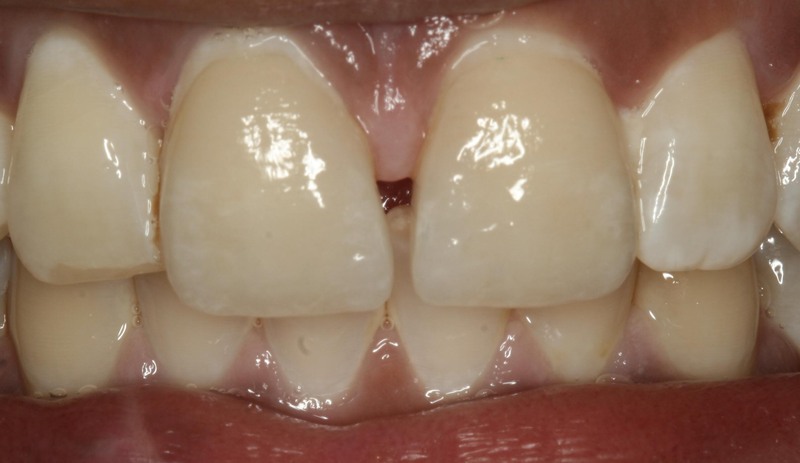 Replacing broken front teeth with a Porcelain Bridge. 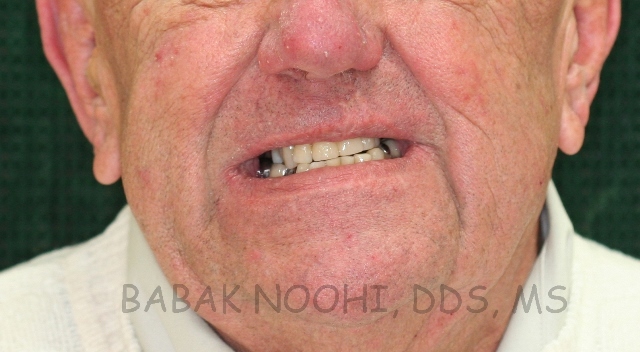 The case below is a conformative treatment of a rather compromised and terminal dentition. 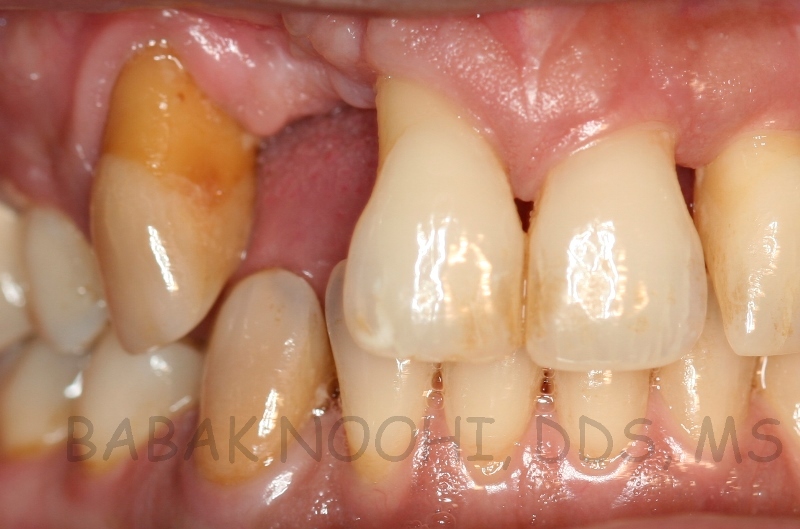 Patient asked me to do my best to improve his front teeth without restoring the back teeth. 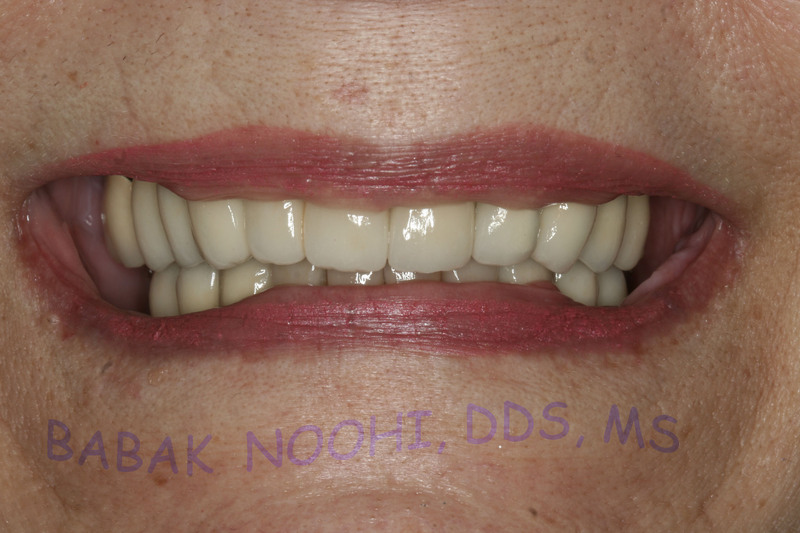 This is a highly customized teatment, using a telescopic bridge with exquisite porcelain work to mimic the shade of her existing dentition and replace the missing four front teeth. 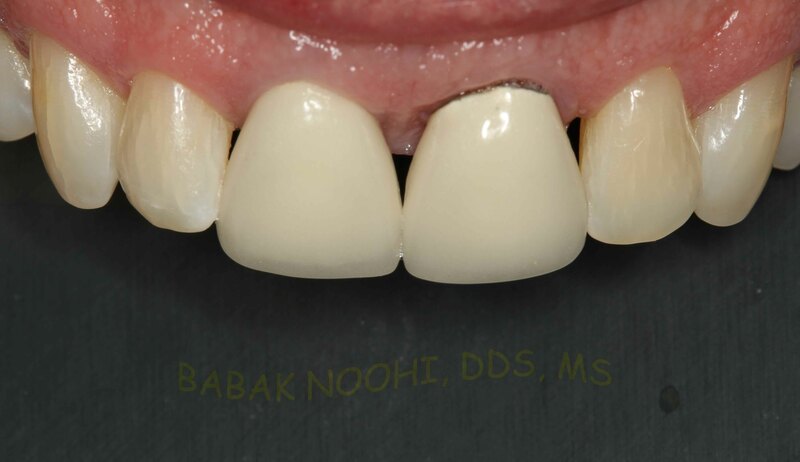 The quality and skills of the ceramist in this case is noticeably superior comparing to the case above. Broken Front teeth bonded together to keep them in. Patient had repeatedly had them bonded. Teeth were not maintainable anymore. 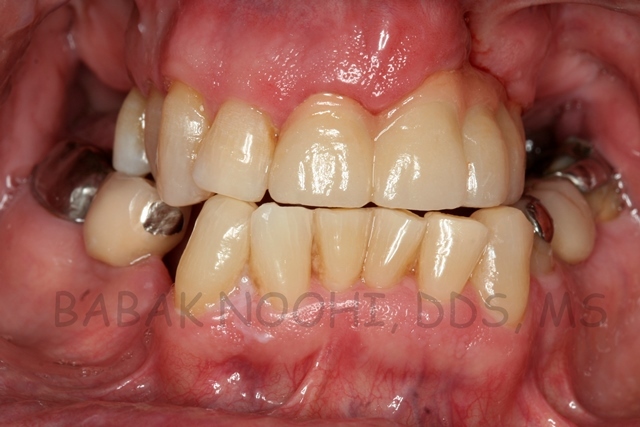 Highly customized bridge to replace the 8 front teeth. 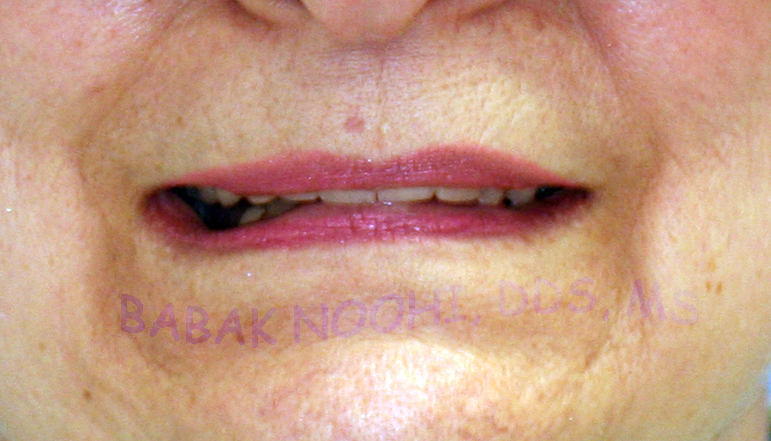 Teeth are stained in darker shade to match her existing teeth and resemble her age. Eight Unit Bridge was inserted in place. Outstanding outcome is obvious. This is a rather difficult task to acheive. Chipping of the front teeth. 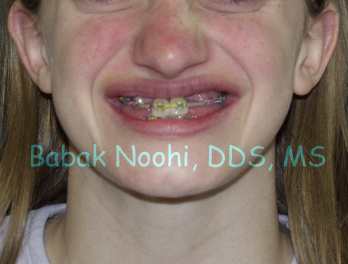 This case is about a young girl who was referred to me after trauma to her front teeth. She fell with her face down and broke her front teeth 5 days before her birthday. She was referred to me to as an emergency, and i stayed after hours to do whatever was necessary to take care of her. The young girl was very embarrassed to smile and did not want to appear with a broken tooth on her birthday. She was confident she could cover her lip laceration with make up but could not do anything about her front teeth. My goal was to make her ready for her birthday and improve the aesthetics short term and provide her long lasting restoration for the future. 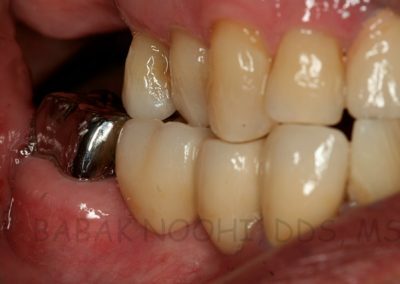 Patient had a diastema (Space) between her front teeth and asked me to keep it. I used e-max press combined with layering technique to mimic her natural teeth. 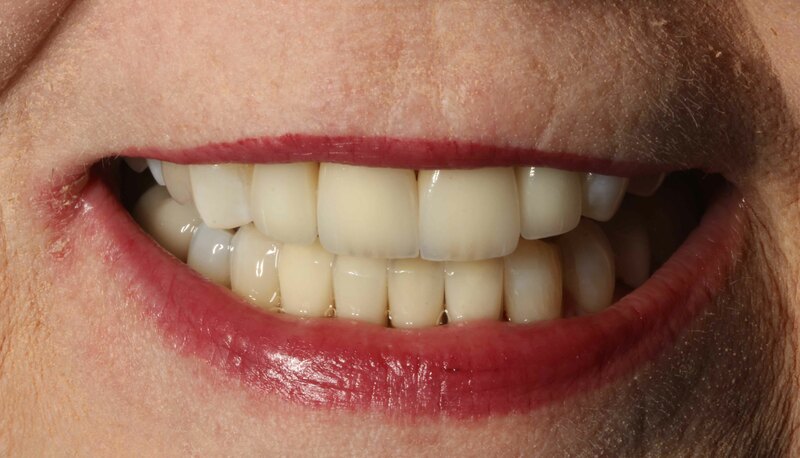 Characterization of the surface was done by a talented Ceramist to provided the same surface texture and white spots to blend them with the rest of her teeth. Two Front teeth were chipped but the nerve is not exposed. 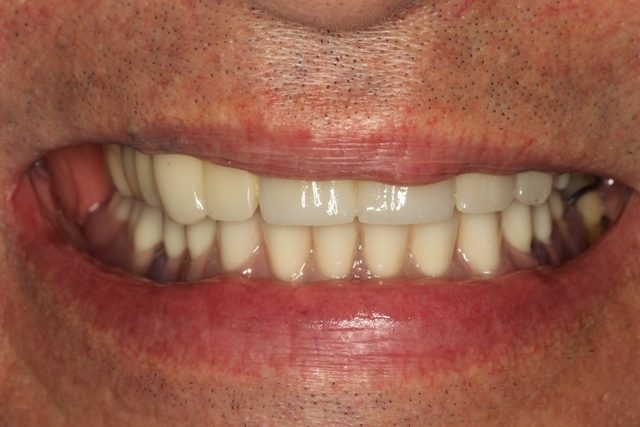 Two Ultra-thin Highly Custoized Porcelain Veneers were permanently cemented. Happy Patient. 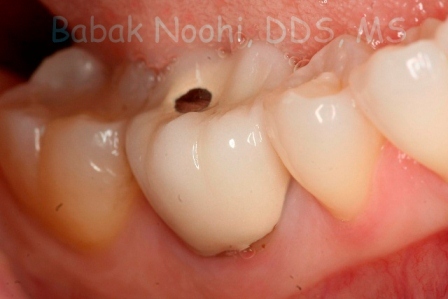 This patient was previously treated to receive a single crown, where two cracks were found in his tooth. 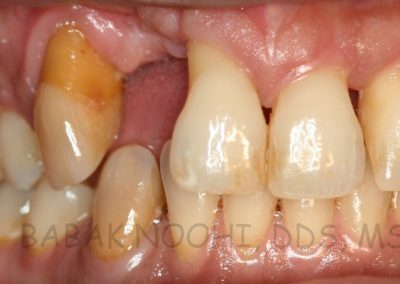 I recommended to my patient a more conservative approach than their previous treatment plan to cover the cracked part with an Onlay instead of a crown. 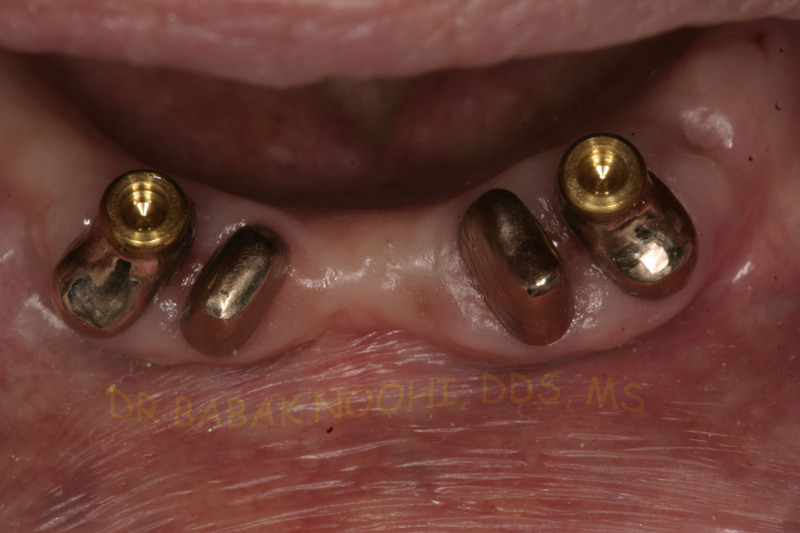 I presented two excellent options for the onlay, gold or ceramic. 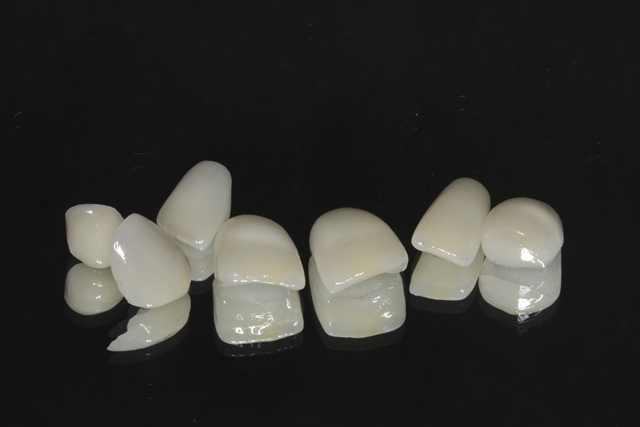 To achieve maximum esthetics, the ceramic option was chosen as a material of choice. An Onlay is a type super conservative cap that replaces only the part of the tooth that is missing and is similar to a “partial crown“, unlike a crown that completely covers the tooth. 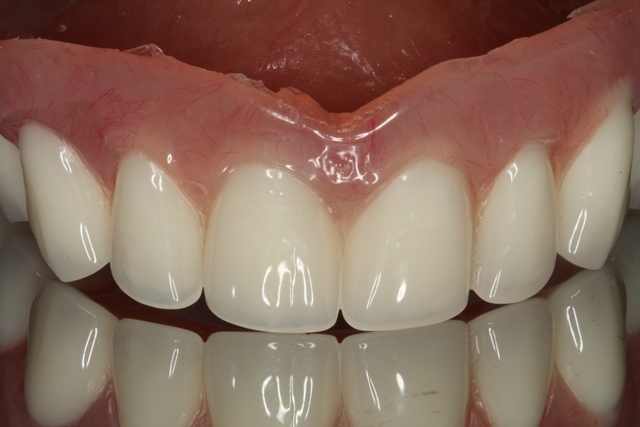 Onlay is a more conservative approach and significantly kinder to the gum (gingiva) when designed properly. 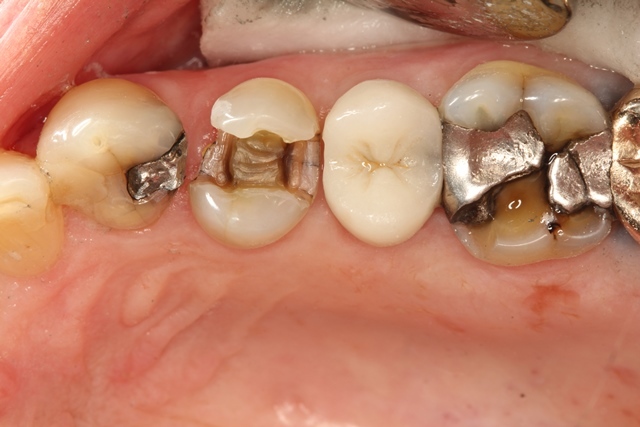 Knowledge regarding tooth preparation design, “resistance & retention forms” is the most important element when recommending this type of restorations, otherwise early failure is inevitable (usually in a form of Onlay keeps coming off). There are many different ceramics used in dentistry. Each ceramic behaves differently and has a unique characteristic. The longevity of a restoration depends of careful choice of ceramic material, beside other factors. Ultra-Conservative tooth preparation #14 to receive a Porcelain Onlay. #12 composite filling was replaced, side view. 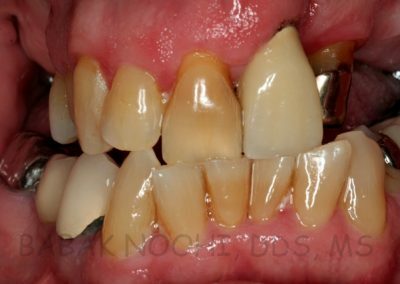 Highly Esthetic outcome with an Ultra-conservative approach. ABOUT PORCELAIN IN DENTISTRY. Why does it matter? Not all “porcelains or ceramics” are the same. They have different characteristics and their application varies from case to case. Their strength, optical characteristics (translucency, transparency), etc. are vastly different. 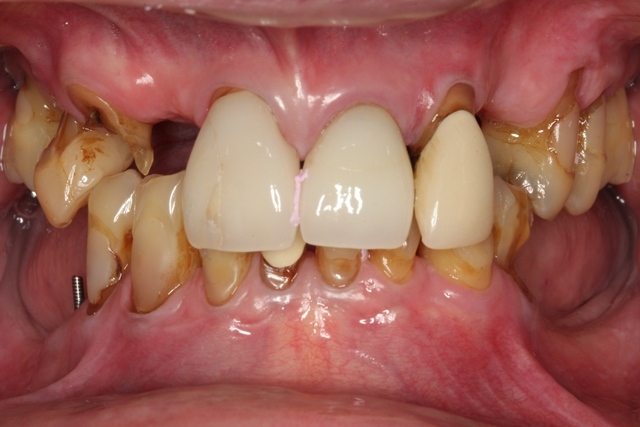 Using one type of porcelain for all cases is most certainly compromising the goal of the treatment. Prosthodontists in contrast to most general dentists are the decision makers when it comes to choose what type of material to use rather than leave it to the laboratory technician to choose what they consider best which is a more common practice. Mixing different materials, will cause optical mismatch with ultimately leads to patients dissatisfaction in some cases and in other material failure. Tooth preparation for a veneer can be challenging and may lead to early failure if it is not filed properly. 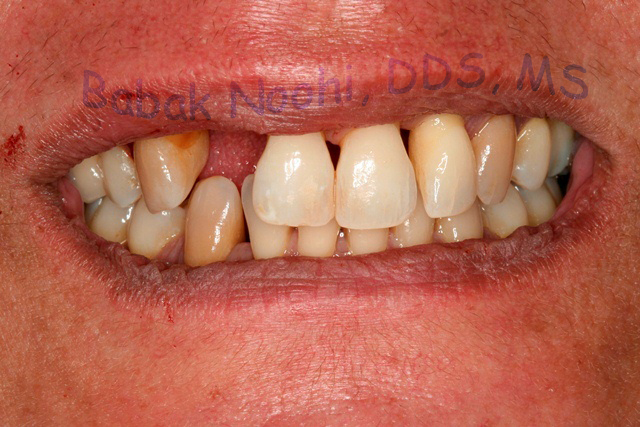 Over filing the teeth for veneer is not an uncommon complication and can lead to a lot of frustration for patients. Application of different types of porcelain requires vast knowledge about dental ceramics. If you think your health matters, go to a professional in the restorative field. Find a prosthodontist today to discuss what is best for you. 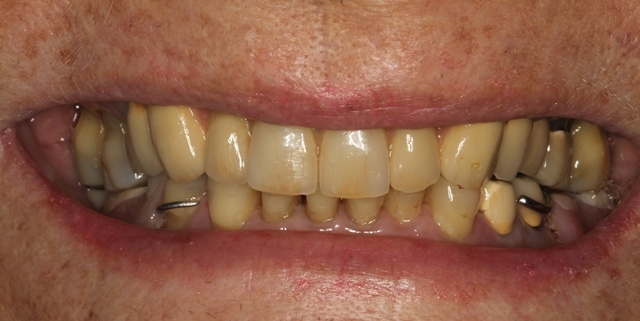 This case is about a gentleman who had orthodontic treatment as an adult to align his teeth, but after 2 years being in braces the two lateral incisors could not be moved. They were diagnosed as being ankylosed, which means being fused to the jaw bone. 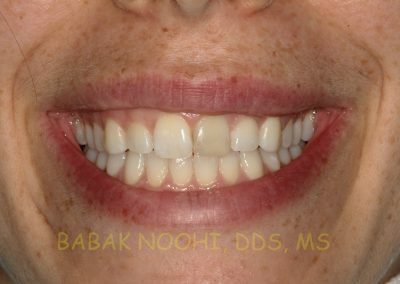 The over outcome of the orthodontic treatment was good, but the patient was not satisfied with the rotated lateral incisors. After giving it a lot of thought, he decided to have the front teeth veneered to idealized the outcome. It was one of those cases that he really pushing for the excellence to maximize the cosmetic appearance, even though the initial impression of his teeth was fairly acceptable in my view. However, as they say beauty is in the eye of the beholder. Initial exam of the patient and meticulous attention to details in collecting relevant data such as, evaluating the smile, taking notes of what needs to be changed, gum exposure teeth shape, shade, texture, facial form, uneven features, fullness of the lips, etc. Photography with professional camera and ring flash, instead of a cell phone, under different lightening will help tremendously to capture valuable information to communicate with the master ceramist when it comes to idealize the smile. Some people like natural looking teeth, and others like fashion model. Shaping teeth for a powerful masculine personality vastly differs from a soft and more feminine personality. 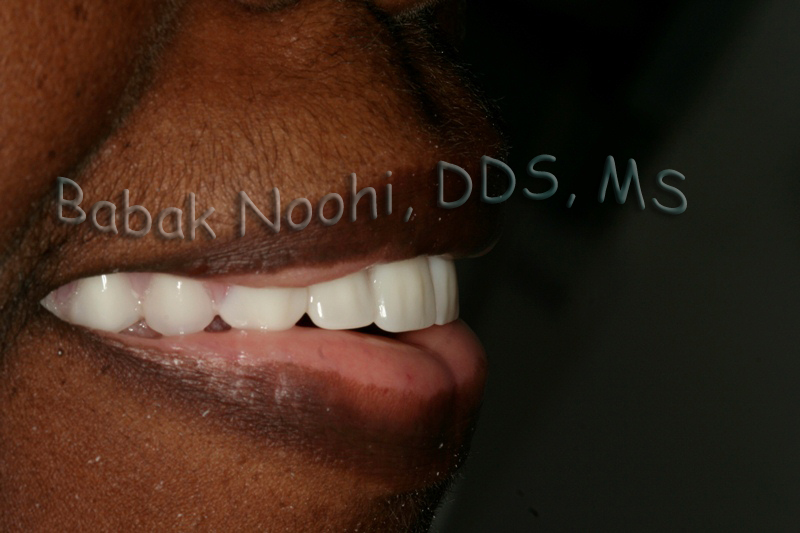 Also, the shape and shade of the front teeth can be as such to express a young age or an aging dentition. That could be a reason why some people choose to go to a prosthodontist to achieve the highest level of care and some other choose a general dentist just to replace their missing teeth. Getting back to our case. 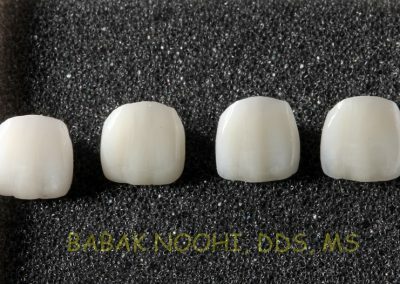 I started the work with a wax up mock up and before touching his teeth, i gave him the chance to visualize what i was going to do and after his approval a tooth preparation guide was used to file down VERY CONSERVATIVELY in such a way that most tooth surface was still covered with enamel to maximize the bonding and longevity of the restorations. 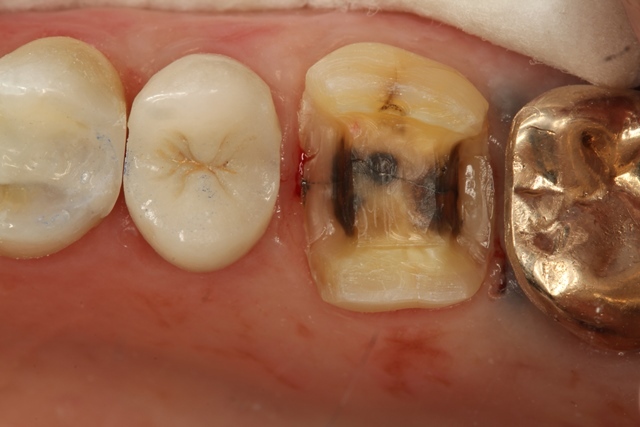 Failing to keep enamel on the surface of the prepped teeth means early failure and de-bonding of the restorations. 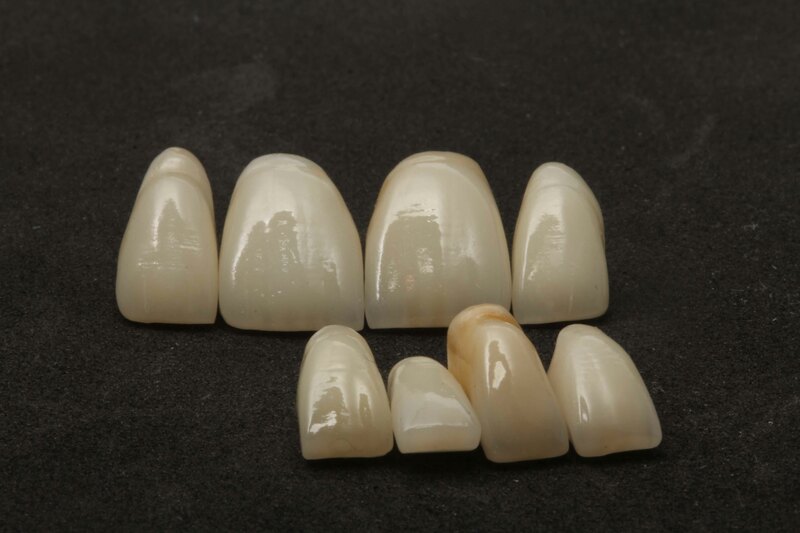 a set of 7 super thin veneers were fabricated by a master ceramist and they were bonded meticulously one at a time. 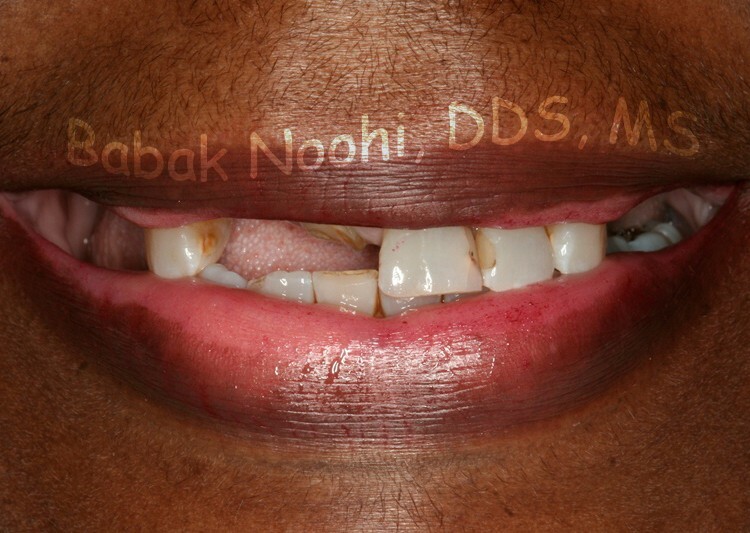 it almost took me 2.5 hours to bond 7 veneers and check the occlusion. 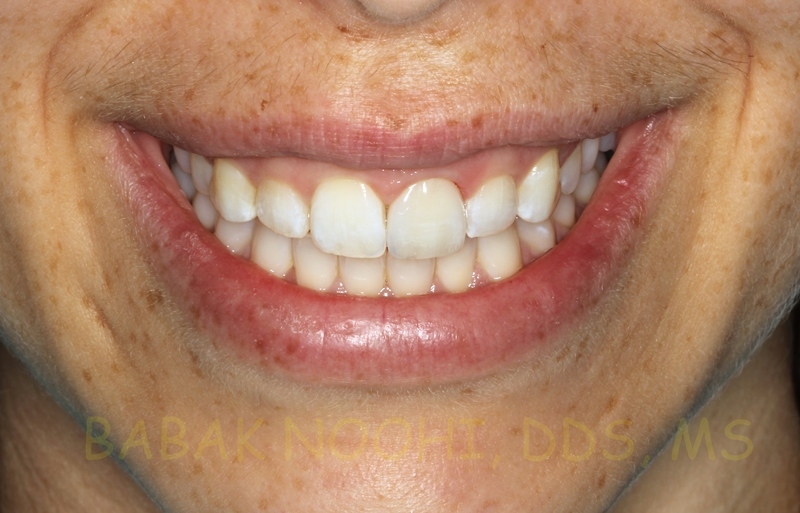 Patient was unhappy about the rotated lateral Incisors which would not be repositioned after two years of orthodontics. Close up of the front teeth. This retired patient presented to my office with a simple request, “Doctor! I don’t want you to make me look like a movie star. But I want you to improve my teeth.” Despite the fact that there were several issues (Oro-nasal communication, congenital upper jaw defect, past history of oral reparative surgery, multiple partials and bridges, etc) to address, the treatment plan was designed to address mainly his chief complaints without any compromise in treatment outcome. Most dentists would like to treat their patients comprehensively and ideally. However, the reality is that not all patients desire to have an ideal treatment or may have financial concerns that prevent them from pursuing an extensive treatment. It is important to recognize this fact and be able to formulate a treatment plan to address most important concerns without sacrificing the quality or longevity of the treatment. Click on the images to see all of them enlarged. Low Self Esteem prevents this gentelman to smile wide. 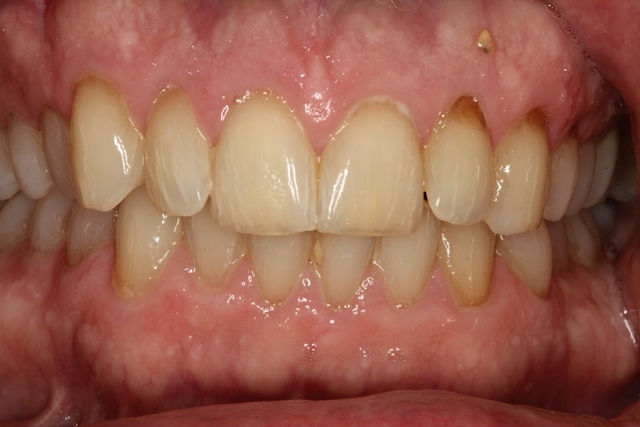 Discolored teeth and lost bridge has caused this patient not being able to eat well. He has congenitally missed many teeth and had jaw deformity. 03 Side view of missing bridge. 04 Upper Bridge was fabricated and delivered. 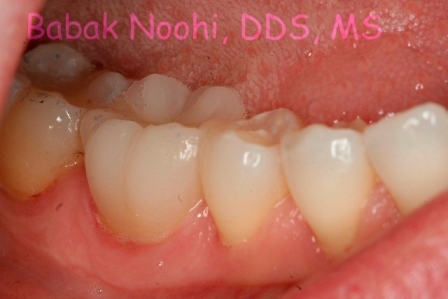 Pink Porcelain was used to cover the gum defect. 05 Upper Bridge Frontal view. 06 Lower Right Bridge was delivered. Upper and Lower Bridges cemented. Not and ideal result , but significant Improvement and that was what he wanted. Restoring the entire dentition is referred to as “Full mouth reconstruction or rehabilitation” and it requires extensive postgraduate training and knowledge regarding TMJ, occlusion, dental materials, and sound principles of fixed prosthodontics. 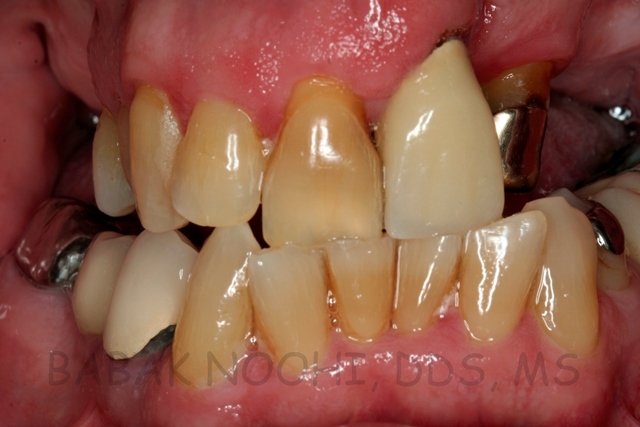 Prosthodontists’ extensive education and training, as well as ongoing continuing education , are more than capable of treating such case with the utmost confidence and predictable outcome. One of my sweetest patients, she used to be a photo model in her teens and twenties. Due to age, loss of back teeth, bite collapse, wear of the remaining teeth, her smile and tooth function had deteriorated. Her main concern was to be able to chew better and to show more teeth the way she used to. Bite Collapse has caused inadequate teeth show. Close up view of patient’s smile. Teeth display and alignment is ideal. 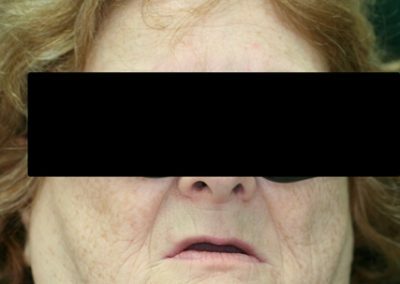 As a result of poor denture fabrication, poor occlusion design, long standing negligence, patient had developed what is called, “Kelly’s Syndrome”. This is a challenging condition in dentistry that requires significant knowledge in prosthodontics, experience along with advanced educations and surgical skills. CLICK on the images to see all of them. 08 Complete makeover of the face, smile and patient could not be happier in this photo one year post treatment. 09Complete makeover of the face, smile and patient could not be happier in this photo one year post treatment. 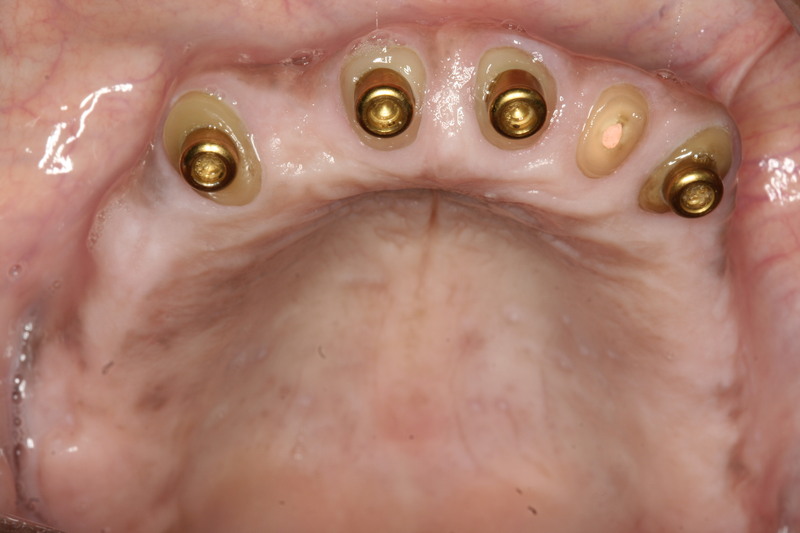 Upper and Lower Implant supported Over-Dentures supported by different types of dental implants. 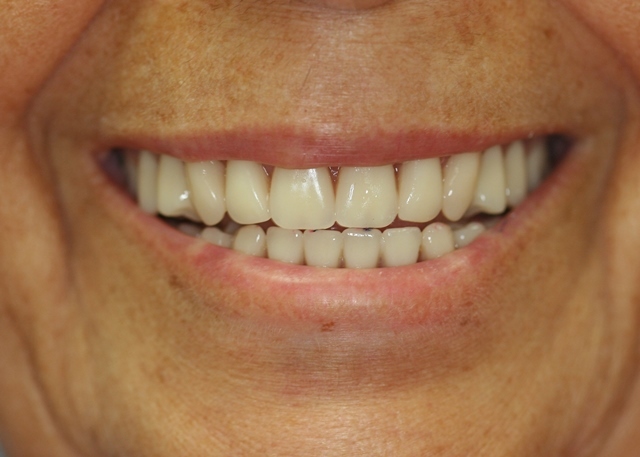 This 84 year old patient had not had any maintenance treatments since her dental implants were placed and restored nearly 35 years ago, using an old implant system (Sub-periosteal and root form implants connected with a bar and ball attachments). 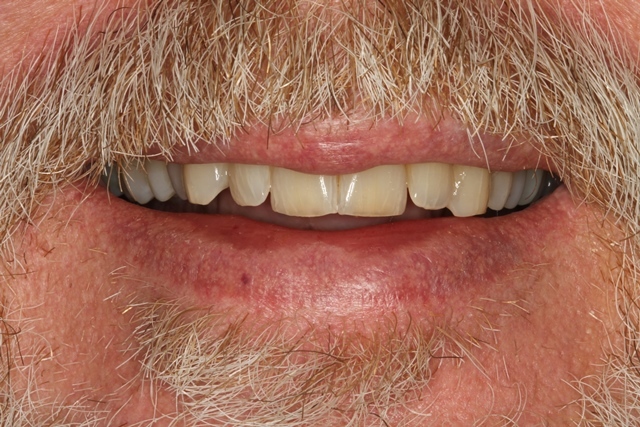 The lower over-denture was lost 5 years ago and was never replaced. The upper over-denture was significantly worn down leaving holes in the denture. 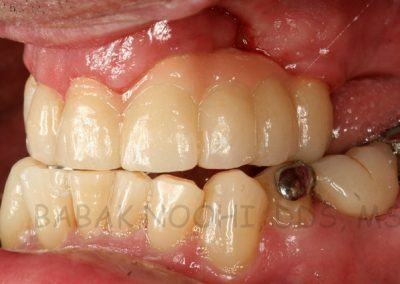 The gum tissue was diseased ( inflamed and bleeding), dental implants were mostly exposed through thin recesses oral tissue. She had been rejected by many dentists to treat her due to complexity of her case on the one hand and significant cost of comprehensive treatment on the other. 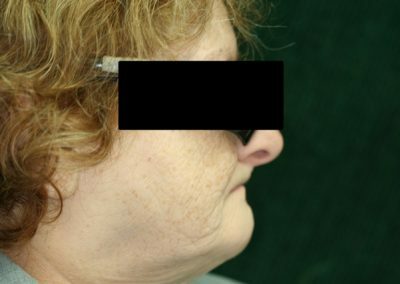 After Talking to patient a couple of times to discuss the treatment plan, a middle ground was fount to treat the patient with minimal compromise in treatment, keeping the cost down and improve the function and aesthetics (which was her main concerns) and most importantly not remove her old implants. 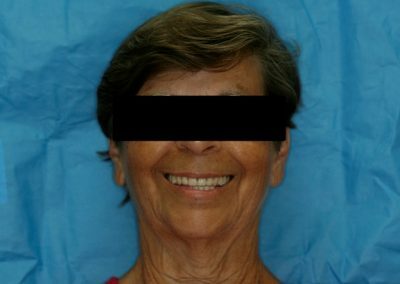 Patient conditioned was stabilized and a new set of over-dentures were fabricated to improve her cosmetic and functional concerns. 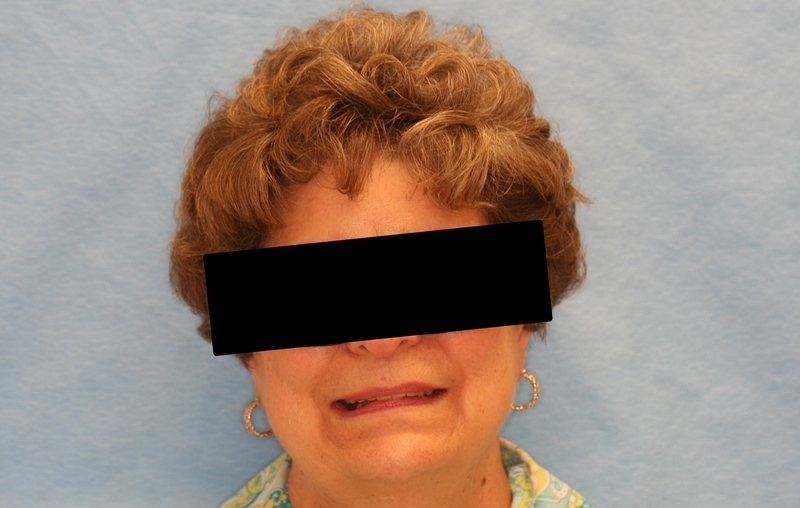 Patient had lost her lower denture and had never seeked to replace it. This has cuased several health problems in her mouth. 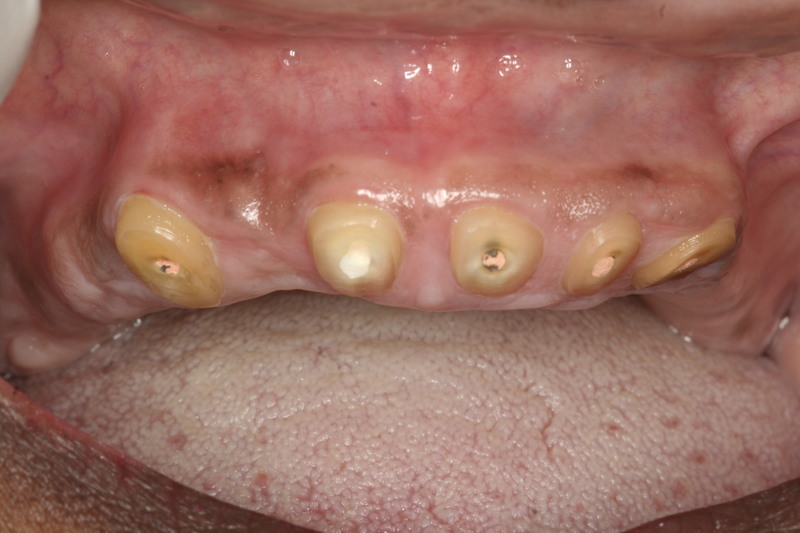 Upper and Lower Over-Dentures in Place. 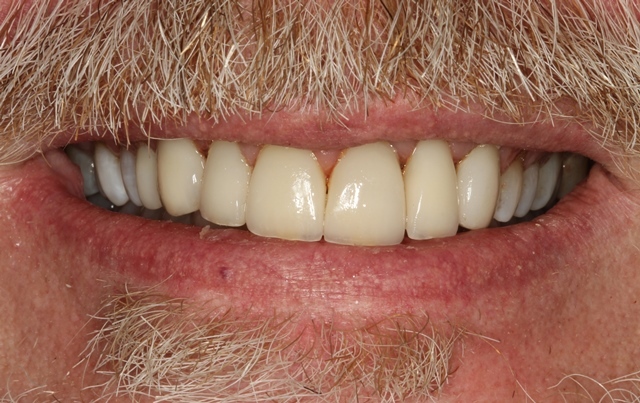 Conventional upper Complete Denture and lower Teeth Supported Over-Denture. This patients came to see me to improve the condition of her failing bridge and denture and requested for an option other than dental implants. 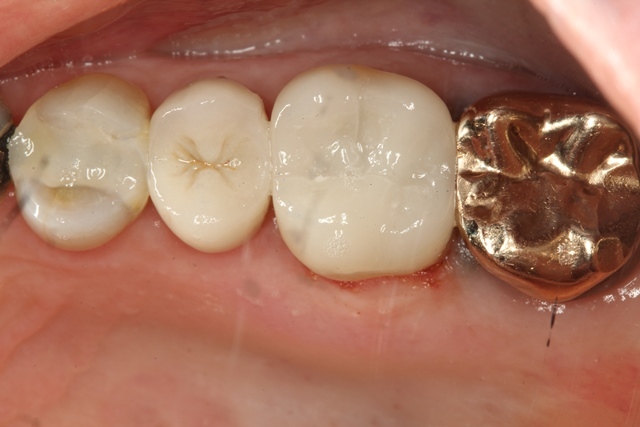 The decayed teeth in the lower arch under an existing bridge were retained, shortened and covered with Gold Copings to protect them from caries. 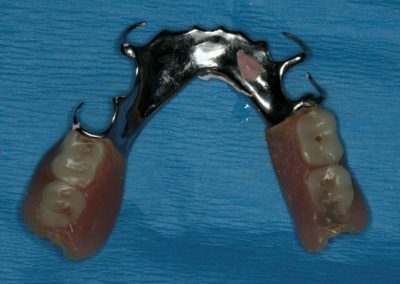 Then two attachments were connected to two teeth to help retain the lower over-denture ( prevent movements during chewing). This procedure would replace the need for dental implants and save patient money and implant surgery. 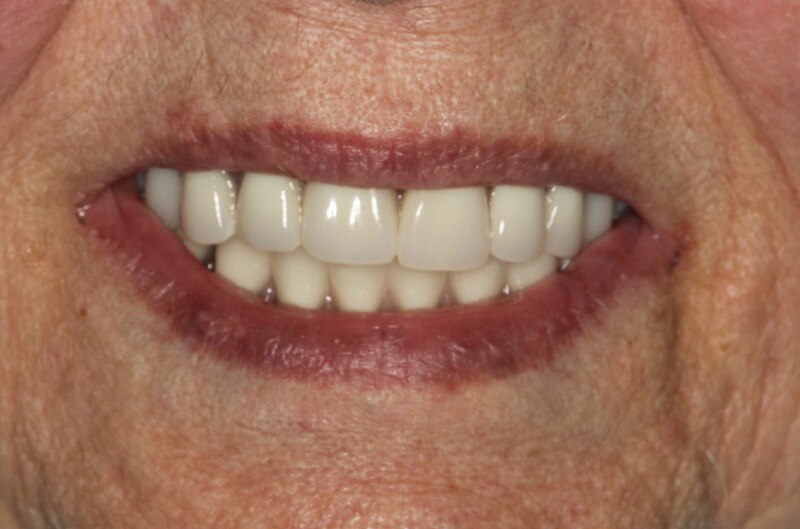 Attention to details to rearrange the teeth in ideal position to follow her lower lip curvature significantly improve the appearance of the denture and gave the patient a life like teeth unlike the fake teeth arrangement of her old denture. 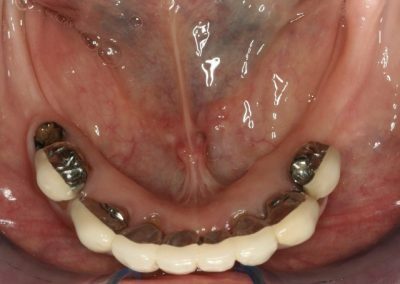 The Front Bridge had to be removed due to infection of two teeth and it was not possible to replace it with a new Bridge. 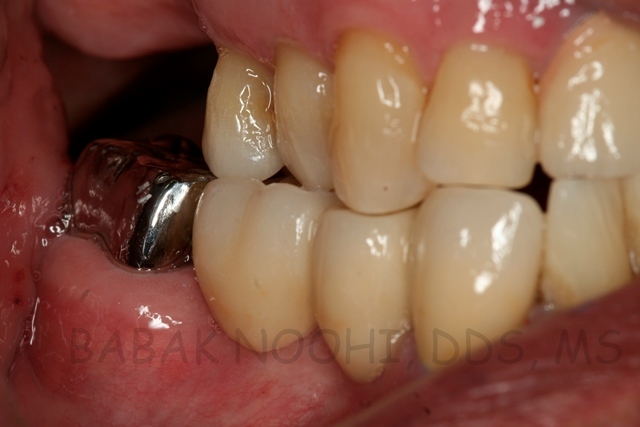 Teeth were treated by root canal Treatment prior to the coping fabrication. An over-denture was fabricated and the attachments were incorporated inside the denture. New Denture and Over-denture in place. The smile was significantly changed. Breakage of a Conventional Lower Complete Denture and Upper Implant Supported Over-Denture. Patient came to see me to repair her “old” broken lower denture. The denture was not thick enough to be strong enough. I recommended her to let me make a new set of dentures and i had a metal reinforcement built inside the denture to prevent future fractures. 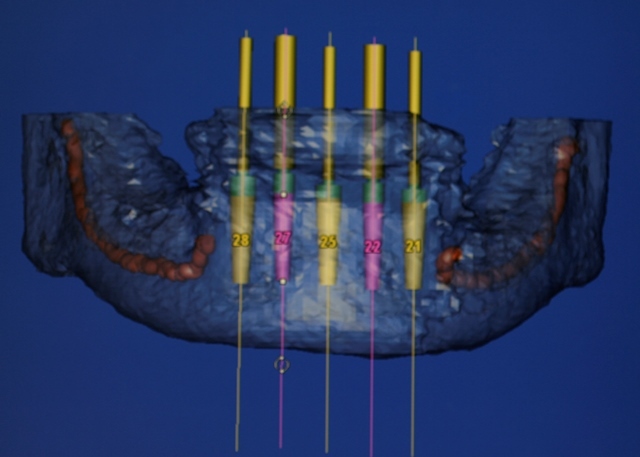 Arrangement of denture teeth were also idealized to improve the aesthetics. 01 Broken lower full denture. 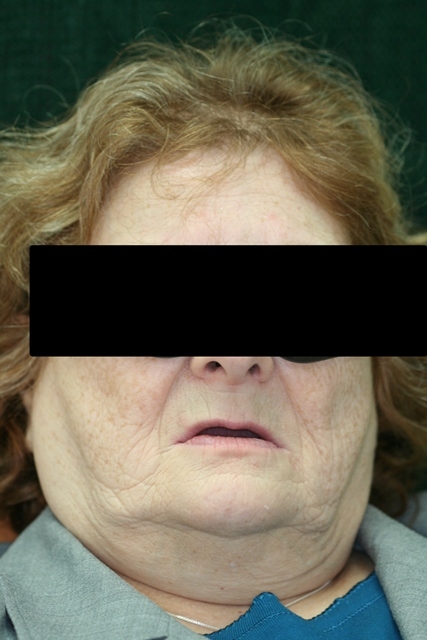 Patient could not eat well and had gained a lot of weight. Broken full Dentures. Has it ever happend to you? 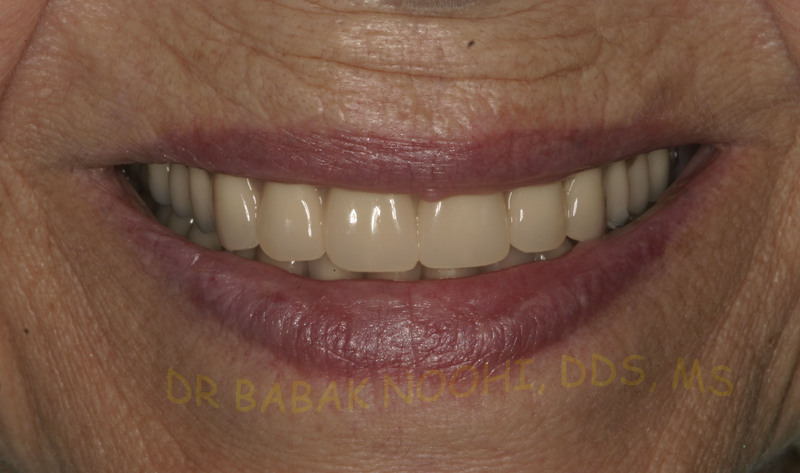 03 Patient could not eat after her denture broke and beside being depressed and sad she had gained a lot of weight. 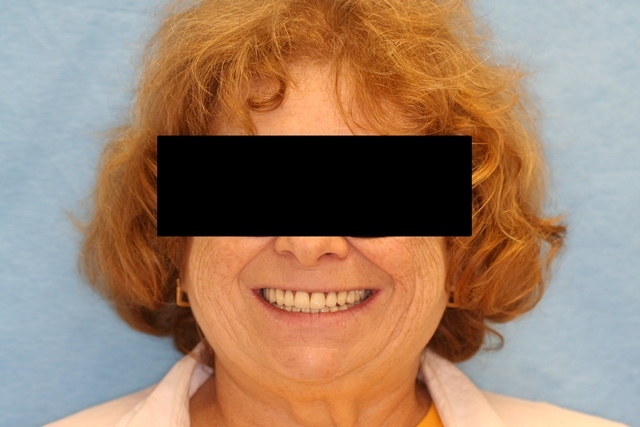 04 A new Set of full Dentures was fabricated and it shows how happy she is. She has also lost some weight. What is an “immediate denture”? 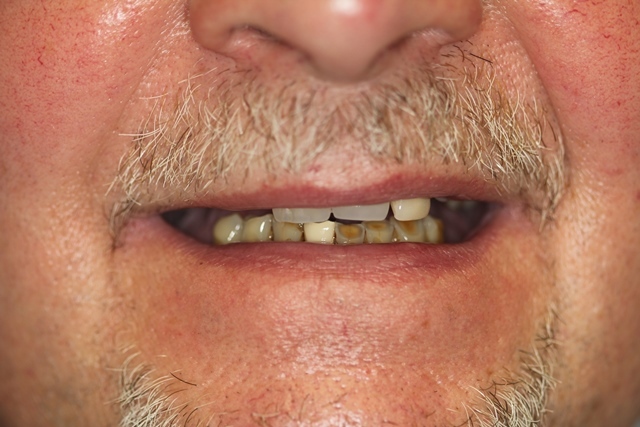 Immediate Denture is can be worn for several weeks, but it is best to be replaced after the extraction sites are healed so there will be an intimate adaptation between the healed tissue and the new denture. 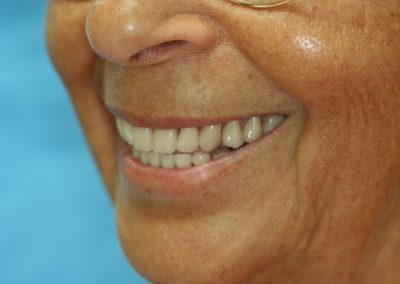 It is not uncommon to have the immediate denture relined chairside as the extraction sites heal to improve its stability. There is a fee associated for each chairside reline. 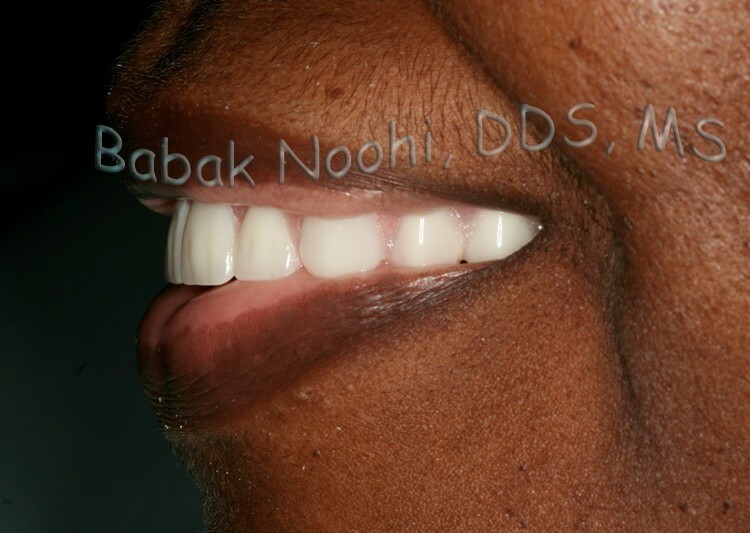 This female patient came to me to replace her crown on a front tooth which kept coming off. 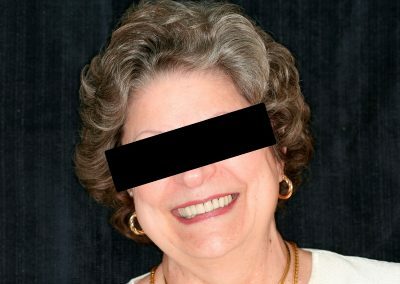 “I’ve never had dentures before and I am afraid of dentists”, she told me. She stated that she used to go to a dentist only for emergencies. Instead of re-cementing her poor-fitting crown, I recommended a more definitive solution to improve her aesthetics and provide function for better chewing. 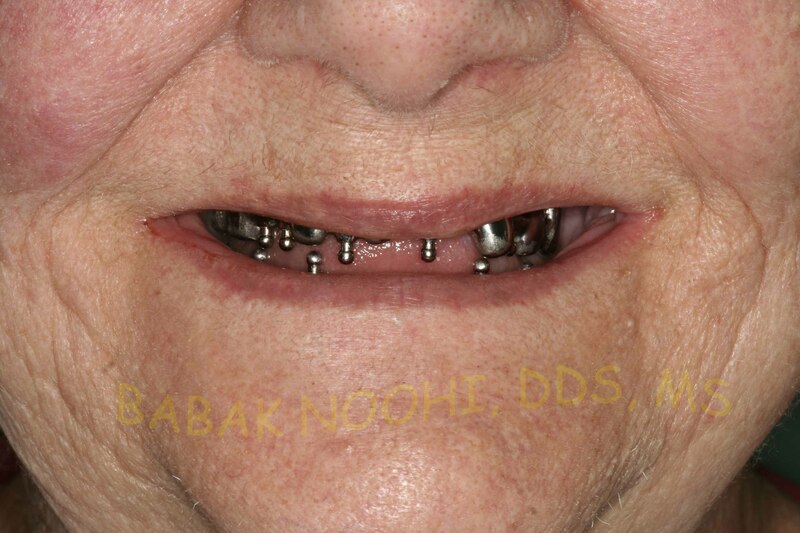 After gaining her trust, we started the treatment plan to get an over-denture retained by “Locator” attachments. 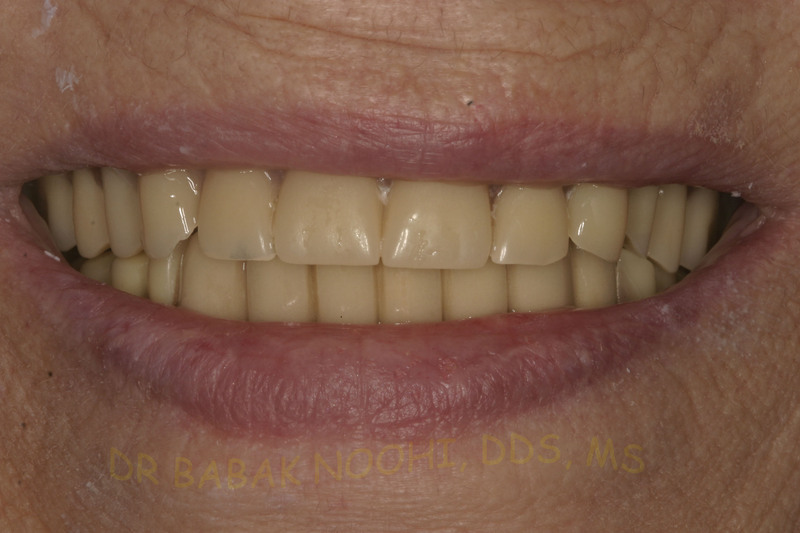 Instead of extracting her teeth and giving her a complete denture, i kept the roots and used them as anchors to support and retain her denture so it won’t move during function ( that is why it is called Over-denture in contrast to conventional denture). Treatment with the over-denture resulted in an extremely happy patient and a new addition to our dental family. Having a good planning strategy and extensive knowledge on how to execute each step allowed us to create predictable and positive outcome for the patient and save her several thousands of dollars for dental implants supported over-dentures. Extracting teeth is an irreversible treatment. Before you have your teeth extracted, consult with a prosthodontist. Teeth were decoronated and treated Endodontically. 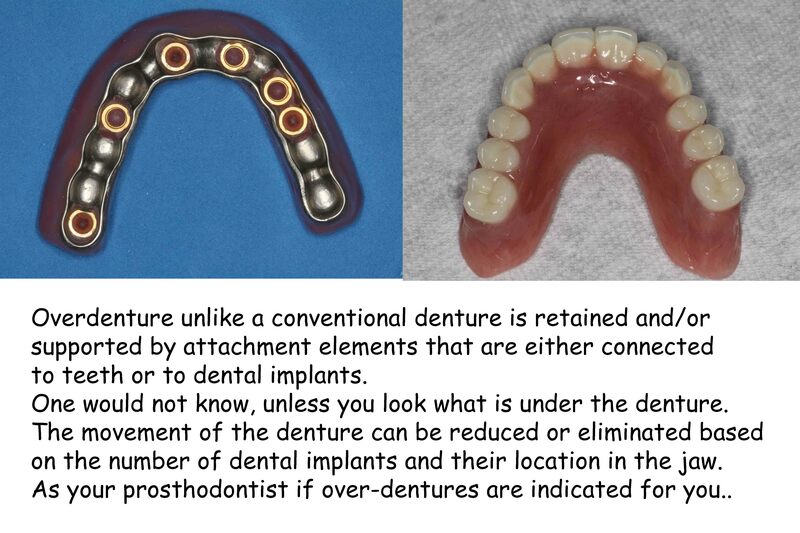 Four Attachments are usually more than enough to keep the overdenture tight in place. 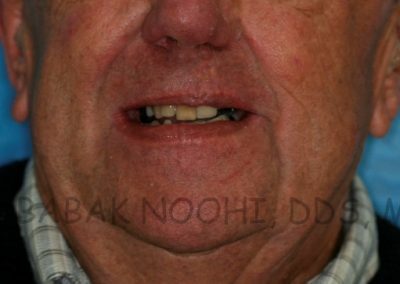 This patient had multiple broken teeth which were not restorable and it was determined to replace them with an immediate complete denture and if he decided to convert it into an implant supported over-denture. 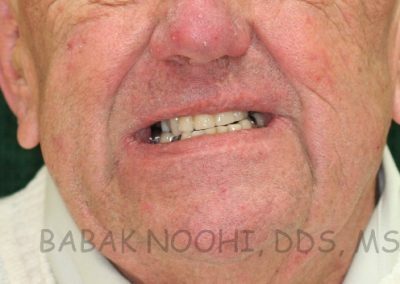 One of his teeth in the front of his mouth which had a root canal was retained to be used as an anchor to provide more retention. 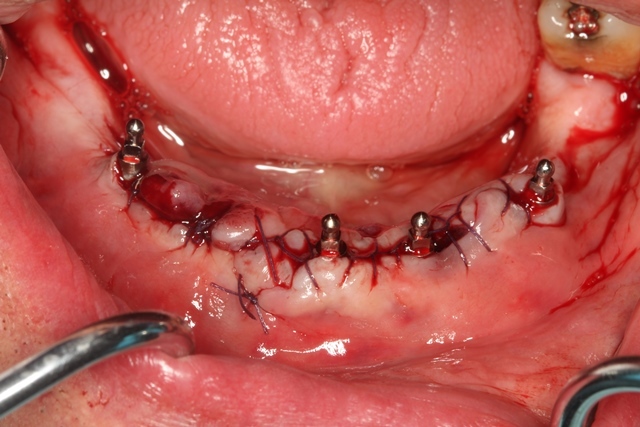 This was done by screwing an Attachment to the root of the tooth. It is a similar concept when a dental implant is used except that in this case it is connected to a tooth and not to a dental implant. 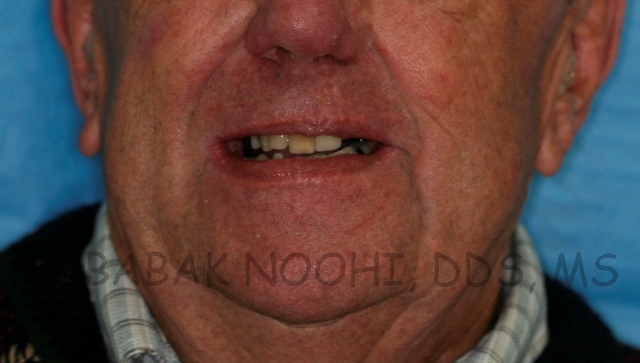 I also had a full denture fabricated so right after extraction of his teeth he would wear it. It is called “Immediate Denture”. A New Denture was fabricated a head of time. 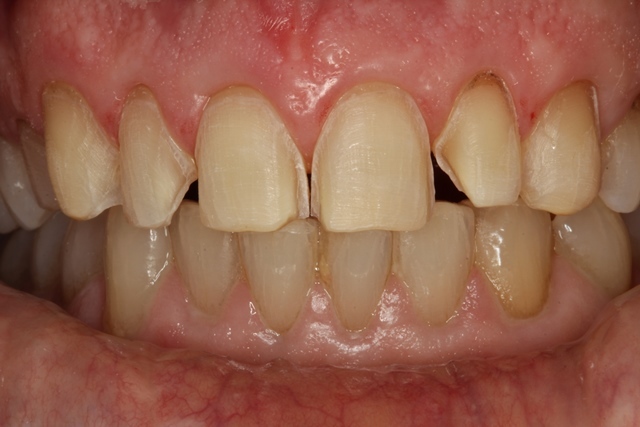 Full Denture was delivered immediately after extraction of teeth. 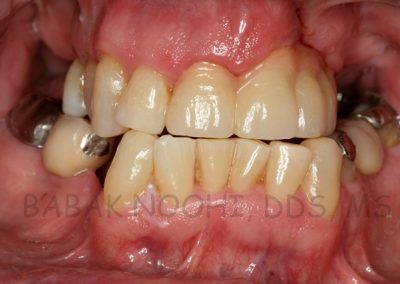 Periodontally compromised teeth in the lower arch were not salvageable and were planned for full extractions. 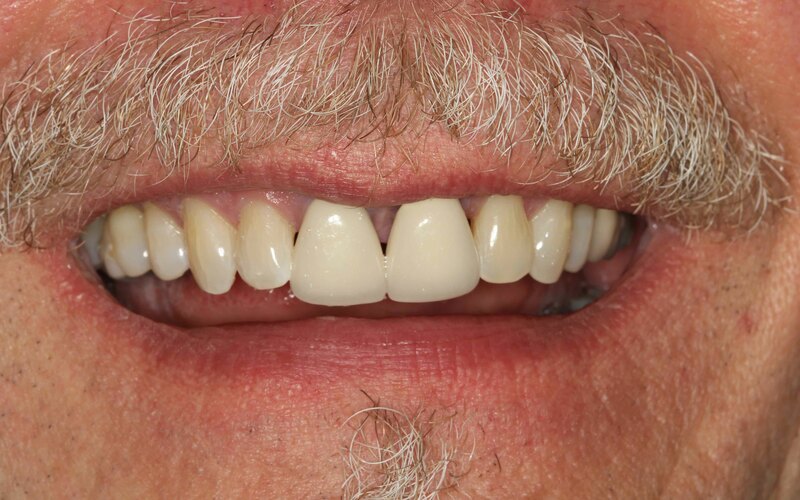 An immediate complete denture was fabricated and relined with soft reline right after extraction all the lower teeth. 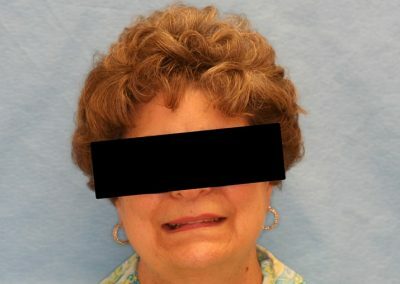 Occlusion was checked and pt left with confidence that her lower denture is stable during function. 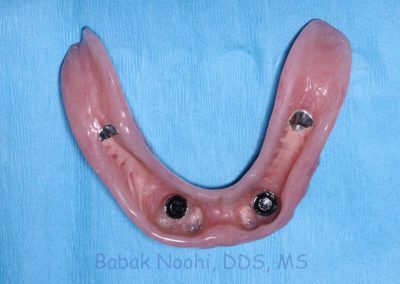 Using mini Implants to retain and support lower denture is the best way to keep the lower denture in place. It is almost impossible to keep the lower denture stable in the mouth, if all the teeth are extracted. Most patients choose not to wear any denture than to deal with it constantly moving. It is exteremely important to be mindful of this fact so you won’t be disappointed. If it is a concern for you, ask your dental specialist how he/she can help you. Significanltly loose teeth, planned for extractions. Lower teeth were too loose to save. Periodontal disease had caused significant bone loss. 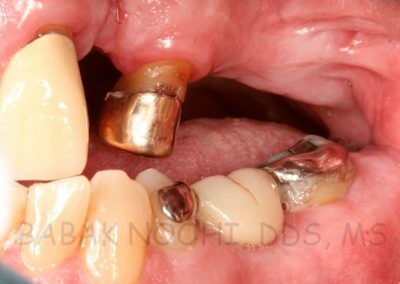 all the teeth were extracted and Mini Implants were used to stabilze the Over-denture while the conventional implants were healing. Immediate Denture was fabricated and inserted right after extraction. 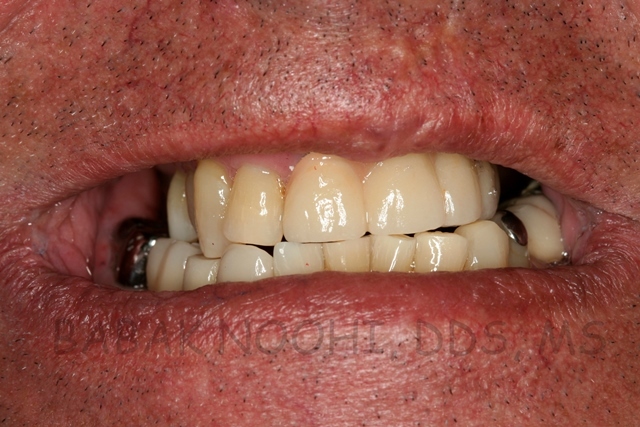 This photo shows the delivery of the lower arch immediate full denture retained by Mini Implants. Helping children and young adults with congenitally missing teeth or malformations is so rewarding I cannot put words to it. The smile and gesture of satisfaction that you see in their faces at the end of the treatment is priceless. There are times when the missing teeth, malformed or impacted teeth due to congenital malformations can be corrected by variety of prosthodontic treatment. It is crucial to emphasize the importance of consulting with a specialist who has a broader knowledge and skills to take over this type of cases. 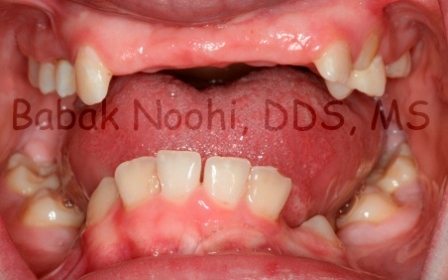 E. was young teenager with congenitally missing multiple teeth. 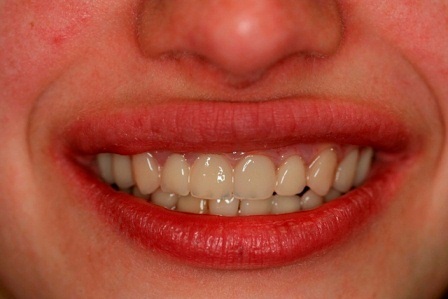 The first photo presents her smile prior to treatment. 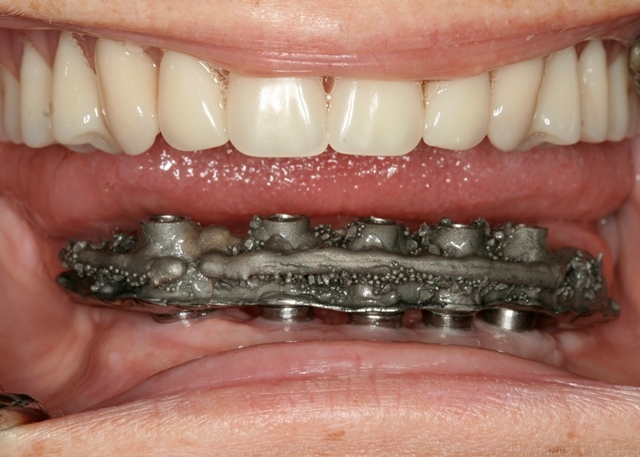 Orthodontic treatment to move her teeth into arch and align them properly was not successful after two years. Most of the teeth were fused to her jaw bone which prevented them to move. She was referred to a prosthodontist to restore the case with prosthetics to improve the aesthetics and restore function so patient can eat normally. The extend of acrylic under her upper lip improve the inversion of her lip by replacing jaw bone and providing lip support. 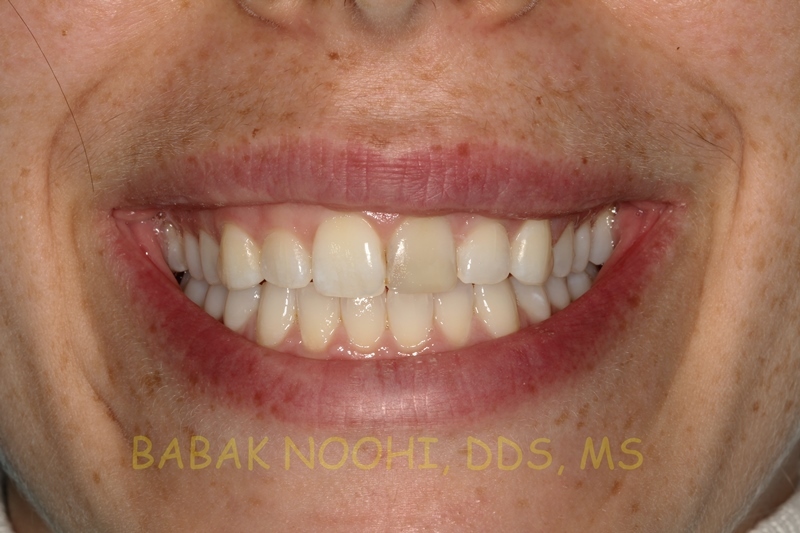 The outcome of her treatment was a happy patient with a beautiful smile. 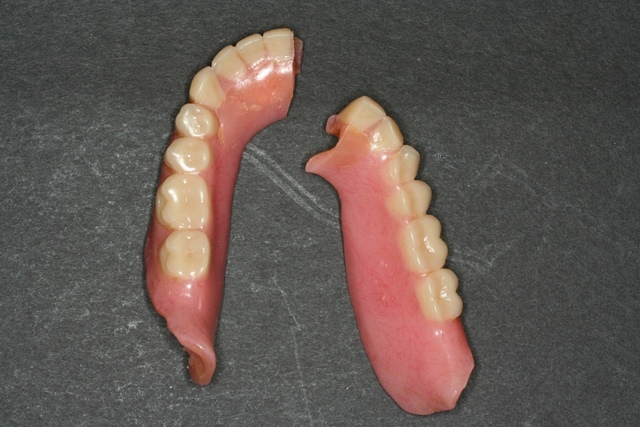 Fabrication of a set of OverDentures to restore the aesthetic and function. Fabrication of a set of OverDentures to restore the aesthetic and function. Patient very happy with her New Smile.